Everyone’s favorite Little Golden Book Christmas story is now available as a large-sized picture book! 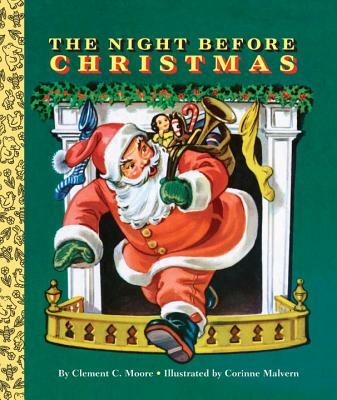 A large, sturdy picture book edition of the classic 1949 Little Golden Book The Night Before Christmas is now available for Santa’s littlest fans! With its shiny, colorful pages, this large-sized Little Golden Book is great for reading aloud as a family on a winter's night, and makes a perfect gift! Clement C. Moore was born in the Chelsea section of New York City in 1779 and wrote his famous poem for children there in 1822. CORINNE MALVERN (1901–1956) illustrated many Golden Books in the 1940s and 1950s, including the popular titles A Day at the Seashore; Doctor Dan the Bandage Man; and Nurse Nancy.